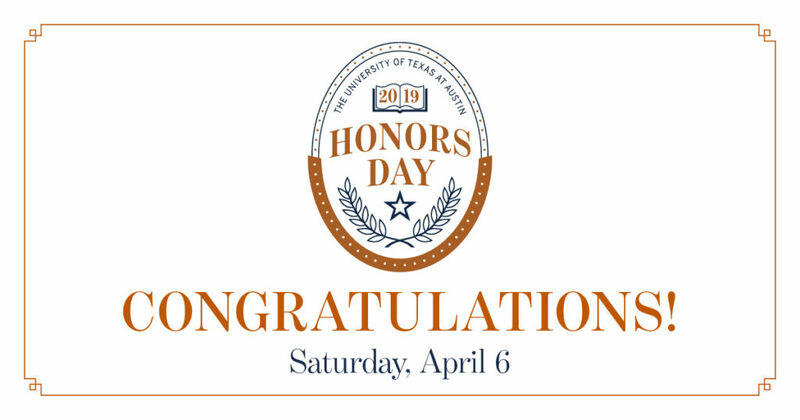 The UT Tower will shine with burnt orange lights Saturday, April 6 in celebration of Honors Day. Introduced in 1948, Honors Day is the occasion when students who have achieved academic excellence are honored by administrative officials, academic deans and members of the faculty. It serves as an important prelude to Commencement. The Honors Day Ceremony includes ceremonial elements such as an academic procession, orange and white honors cords worn by students,heraldic banners, inspirational messages and celebratory music. For the 2019 Honors Day program, there are 4,354 honorees, of which 3,554 qualified as College Scholars and 800 qualified asDistinguished College Scholars. Names are listed alphabetically by college or school.